:- Computer is an electronic device which is given data to processing output requirements. ◆ Who is the Father of computer? :- "Charls Babbage" is known as father of computer. He was a english mathematician. 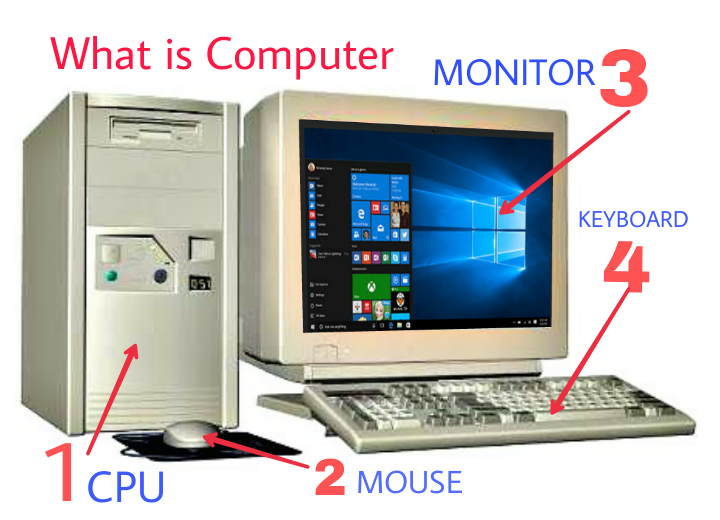 ◆ Who is the mother of Computer? :- "Lady Adalova Lace" is known as mother of computer. She developed programming idea for charles Babbage machine's. She is consider to be "First programmer"
The C.P.U. is the most important component of computer. It contains the microprocessor chips which perform all the operation according to the given instructions. So, It is also known as brain of computer. computer accepts Data from RAM ( Random access memory ). 2:- Decoding Data :- In this function the Data will converted into Machine language. 3 :- Excuting Data :- In this function our C.P.U. process our data according to the given instruction. 1:- A.L.U. (Arithmetic and logic unit) :- It Is the main part of our C.P.U. which perform any type of operation. According to the given Instruction operation like- addition, subtraction, multiplication, and division are also perform Logical action. 2:- C.U. (Control unit) :- It accept Data from RAM, convert them into machine language and send A.L.U. for processing it control the entire computer system and also verify the final result of our data which are given by A.L.U. after processing. :- The Mouse is a computer input device used to move a cursor around a screen. :- A panel of key that operate a computer or type-writer is called keyboard. It is a input device of computer. :- Monitor is an output device which shows us what's running on the computer. It is Very important part of computer. ◆:- Hardware :- A physical components of the computer and mechanical part of system which are touchable. ◆ :- Software :- Software is a group of programme which perform special types of works and common in use in anywhere and any computer that is called Software. When two or more programme are combined together, or the programme along with disks or tapes on which they are store is called Software. :- Data is a collection of facts and figures. It is just like raw materials which after processing gave meaningful result. 1:- Input :- In this function Computer accept Data from user or the information put into the computer in the form of Data, etc. 2 :- Process :- In this function our computer process the data according to the given instructions. 3:- Output :- In this function computer provide the result of processed data. ◆ Hardcopy :- The result which we can be view and touch by us is called Hardcopy. ◆ Soft copy :- The results which we can not touch only we can view is called Soft copy. If you Likes my this article then share my blog and give me a feedback.